How should one go about reheating pasta? Ok, so, I know the answer, "You shouldn't, because it's easy to make it fresh." But on occasion, I end up making too much pasta, not having enough sauce, etc. and the pasta gets stowed in a tupperware awaiting a secondcoming. Usually it just ends up being packed for lunch and eaten cold. But on those other occasions, when I may like to have it warmed up and served with a sauce of some kind, what would be the best way to go about doing so? I haven't really experimented yet, but thought maybe putting the pasta in a steamer basket could work well? Has anybody tried this? thoughts? easiest way is to mix it with the sauce and heat both up together. Usually I'd do this in a pan, but you could use a microwave. If you have to heat the pasta up on its own, what I usually do is do it in a pan and add a little boiling water, just a couple of tablespoons, enough to stop it sticking, and keep stirring until its warmed through. If it starts to stick add a little more water. You could do this in a microwave I'd bet, but I don't have one. For small amounts, I have good luck reheating pasta in the microwave with a little butter or your choice of sauce. The moist heat does a good job of allowing the starch granules to soften back up. I tend to like leftover pasta for breakfast. Yes I am weird. I just heat some butter in a pan, add the pasta, and toss until hot. Maybe some parm or grano padano sprinkled over. It's delicious. Otherwise I reheat in the sauce (so the slightly dried pasta can re-absorb some liquid) in a slow pan until ready. I've steamed my pasta -- in fact, it's how I reheated pasta during my years of living without a microwave. The important part is to not overcook the pasta in the first go through -- pull it when it's al-dente; I'd also toss in some oil or butter so the pasta wouldn't stick together, as you want the pasta loose in the steamer, not a giant glob of fused pasta. I'd get it most of the way heated through, and then finish it in the sauce. On days I was lazy, if it wasn't a really thick pasta, I'd just heat up the sauce, and put the pasta in for a minute or less to reheat. The important part was that the pasta was oiled so it wasn't a giant lump, and the sauce could get in there to heat the pasta up. If it is a lot of pasta I add an inch or so water to the bottom of my pasta pan and reheat it slowly, stirring occassionally, it usually takes just a couple of minutes to heat. If it is just for me I pop it in the microwave with a little ketchup, I tried adding additional sauce and the microwave always tends to dry it out not so with ketchup. I put it in a plastic storage bag (quart or gallon) and put it in the microwave for 30 seconds to 1 minute (depends on amount I'm heating) and do not seal the bag. This works great and you can store it in the same bag. 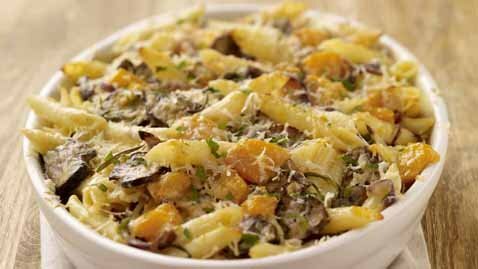 You could also make any kind of leftover pasta dish like a gratin or a frittata. Use a half cup of water to one cup of leftover pasta you intend to plate. Drop desired amount of leftover pasta into appropriate amount of salted/oiled rolling-boil water for 30 seconds (use 1 tsp of EVOO). If you're reheating more than 4 cups of pasta, increase boil time to 45 seconds. Drain immediately and serve with favorite sauce or topping. Not the answer you're looking for? Browse other questions tagged pasta culinary-uses reheating or ask your own question. Should I cover food while reheating it in a microwave?